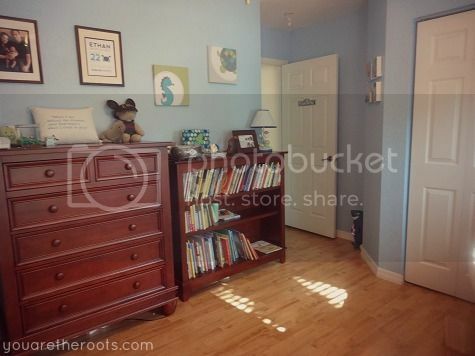 I recently posted an unveiling of Ethan's new tot school room and it got me to thinking about how I haven't ever really posted a decent room tour of Ethan's bedroom. 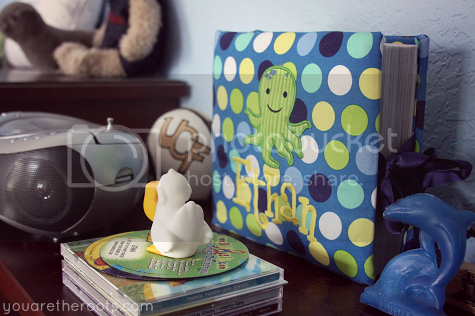 His room is my favorite room in the house (as a soothing underwater oasis should be!) and the only reveal I ever did was two days before I had Ethan. 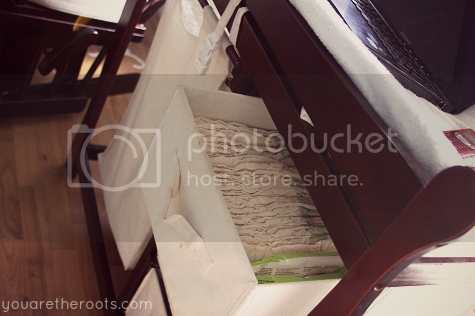 I was on bedrest and unable to lift my DSLR, having to scoot myself around on an office chair while trying to get "you get the idea" pictures to show people. 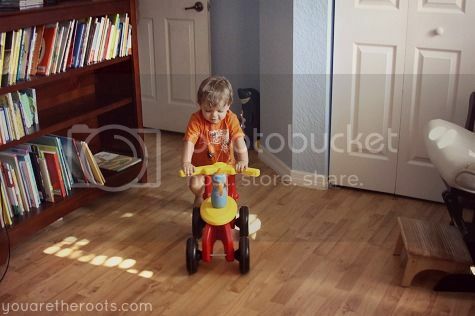 The truth is, a great deal of planning, love and heart went into the creation of Ethan's room and it's changed a lot in his toddler days, too. The wonderful Katie of Priceless Design Studio (who is the genius behind my pretty blog design) added a couple of new buttons for me on my right sidebar right above the sponsor section: one for tot school and another for room tours. The tot school button will bring you to our weekly tot school updates and activities that I'll be updating with each Monday. I'm really excited about the room tours feature, too! After four years in this house, we're finally starting to really settle in and I can't wait to share our progress. Plus, I love looking at room tours and admiring everyone else's pretty decor! 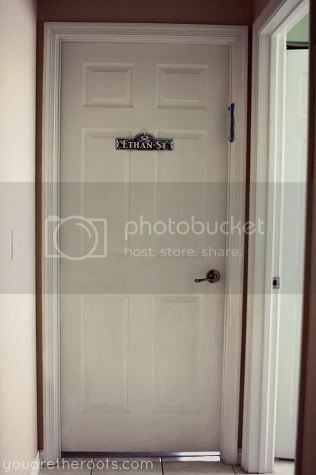 Without further hesitation, welcome to Ethan's room! 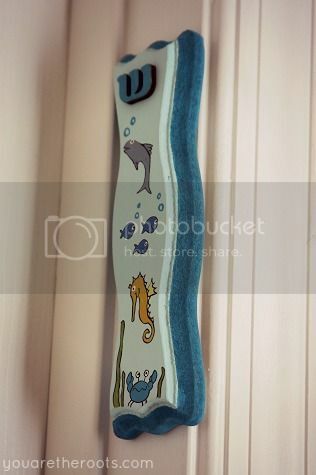 Ethan's sweet underwater mezuzah is a design called Under The Sea by Shelly-Ka who makes some of the most beautiful mezuzahs and other special pieces for children's rooms! 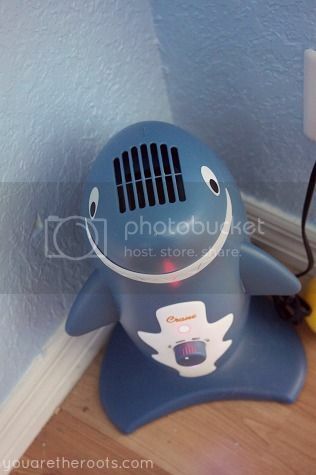 In the corner of his room when you first enter is "Mr. Shark," Ethan's air purifier by Crane. 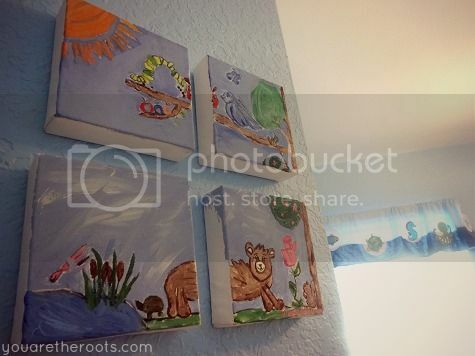 The four small canvases you see when you first walk in were painted by my sister before she was too cool to be bothered. I had just found out I was pregnant and had asked her to paint something for the baby's room, half expecting her to roll her eyes and laugh but instead she did and I've cherished them ever since! 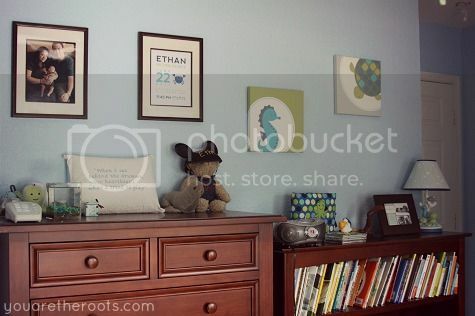 On top of Ethan's bookshelf is a framed copy of his birth announcement from Tiny Prints, a photo album of his first photographs and first month custom made to match his nursery by Miss Sew N Sews, his CD player and lullaby CD's, a sound machine and a few sentimental tsotchkes (his first Miami Seaquarium wax figure, his first Mickey ears from his first Disney trip, a statute my dad brought him from one of his overseas trips, etc.). 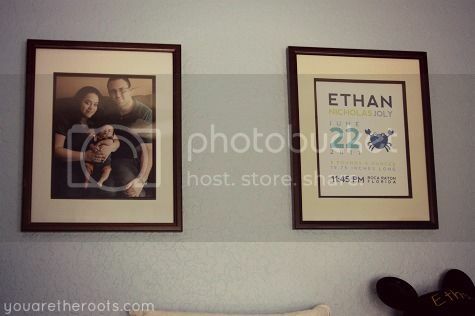 Over his dresser is a framed family portrait from Ethan's newborn days and a custom birth announcement print by Mosie Posies. 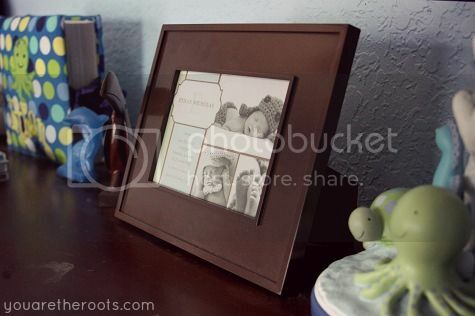 On top of Ethan's dresser are his teeny-tiny frogs, Seymour and Meyer, a keepsake box from his first haircut and a pillow embroidered with yet another one of my favorite lyrics by Bright Eyes. 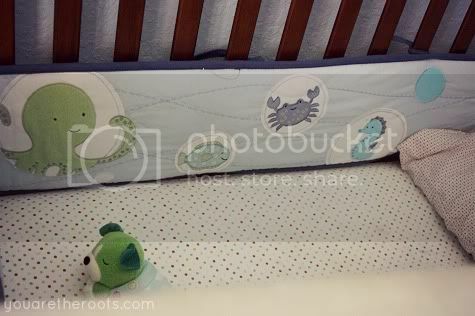 The plush octopus you see peeking out from behind the frog habitat is from Ethan's mobile. The beautiful guitar hanging on Ethan's wall was a gift from his Uncle Mike. 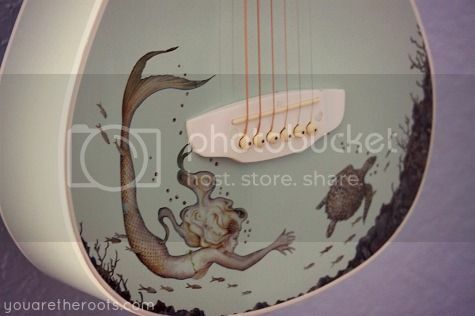 It's the Aurora Mermaid Mini by Luna Guitars and fits the underwater theme perfectly! It took me forever but I finally found cute fishy fan pulls for Ethan's bedroom fan (and for the life of me, I can't remember where I found them -- I actually think E-Bay!). 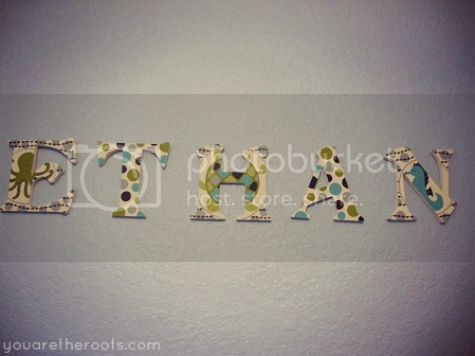 Ethan's name letters on the wall were custom painted to match his nursery by Baby to SO Big. 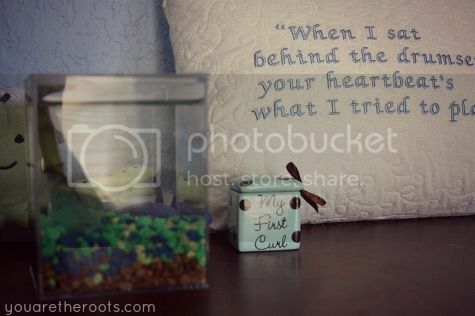 Despite it being an underwater themed nursery, I had these pillows made as soon as I found out I was pregnant (from Meringue Designs). 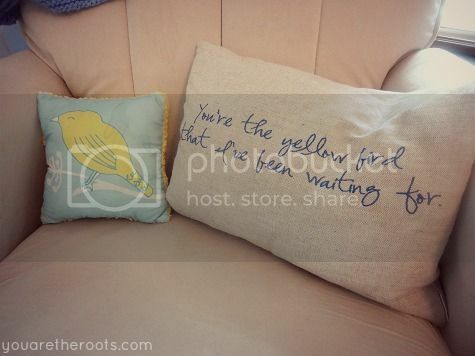 The quote you are the yellow bird that I've been waiting for is kind of my special 'thing' for Ethan and I couldn't not have it present in his nursery somewhere! I love the ocean theme! I remember when I was pregnant, I was hoping for a boy just so that I could decorate the room in the underwater adornments. love the guitar hanging on the wall! Thank you! 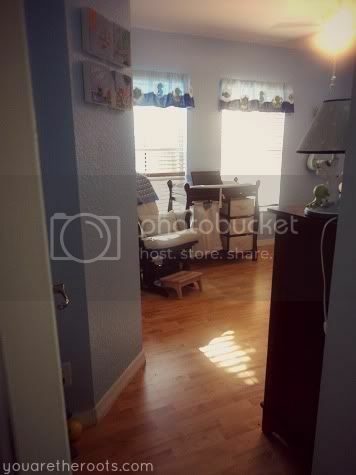 Ethan's room is probably the most spacious in the house (and his bathroom is bigger than our master bathroom -- figure that one out, it puzzles me! Ha!) so I worry sometimes about having another child and trying to find the room. Space is already kind of tight throughout the rest of the house! adorable room! And I love, love, loooove that guitar! Isn't the guitar great?! It's my favorite part of his room. It's so small, too, we had to hang it on a ukelele hanger. 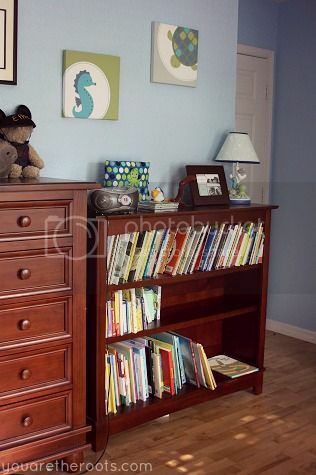 Perfect for a little one's room! 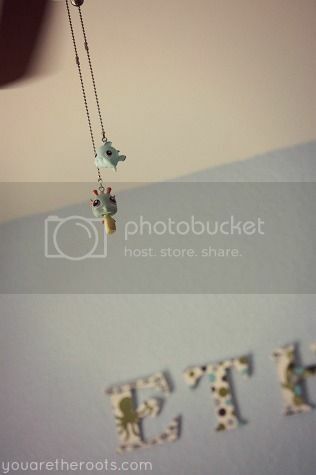 His room is co cute, this gave me some ideas! Anywho i am your newest follower from the GFC Blog hop and i hope u get a chance to visit my blog. thanks in advance and have a great day! Thanks for stopping by! Nice to meet you. 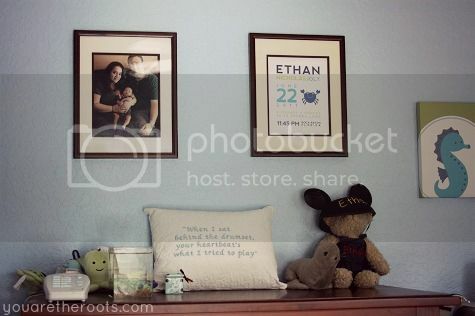 Lindsey, Ethans room is absolutely adorable! I know who I am calling to help me decorate when I have a child!! So much detail, it's amazing!! Thank you! The perks to being on bedrest during my pregnancy = lots of time to plan and nitpick! Haha. I can see why his room is your favorite... I kind of want to live in there. Love how relaxing and serene every part of his room is! It's so, so, so serene! The only chaos-free zone in this house, haha. 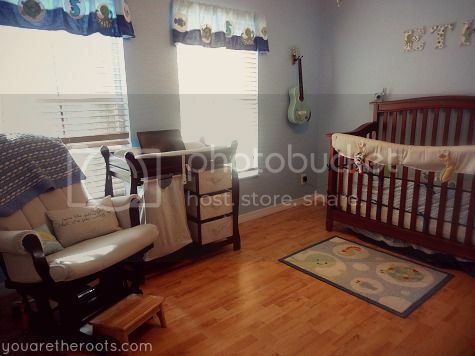 Oh my goodness, his room is adorable! Found your blog through the blog hop! Our babes are pretty close in age and you and I share a pretty amazeballs name (spelling and all!) Love your blog and will most likely spend my day catching up! My blog is www.pavko001.blogspot.com if you'd like to follow back. Nice to meet you, thanks for stopping by! 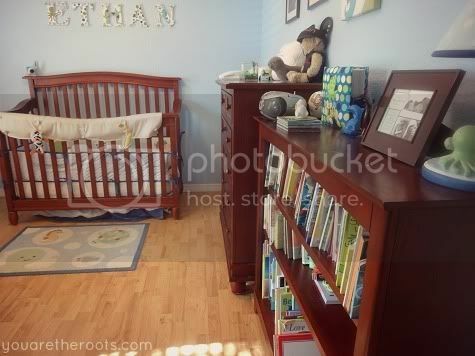 What a lovely lovely special room you've put together for your Ethan. I love the yellow bird -- I think that is so sweet. Nice!Moisture issues are another basic wellspring of indoor air pollution as they can prompt indoor mold development.Mold can likewise emanate VOCs and particulates, compromising indoor air quality and prompting negative health effects.Since it is difficult to take out mold spores,the best way to decrease the effect of mold on indoor air quality is to counteract or promptly repair the moisture issues that empower mold development.Have a nice day.